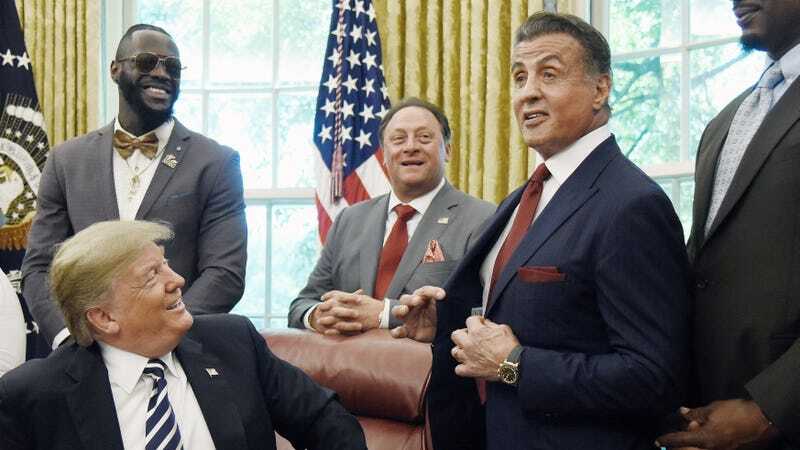 In August, we reported that Sylvester Stallone was trying to drum up some hype for a new Rambo movie, the existence of which had never actually been confirmed, leading us to believe that it may have just been wishful-thinking on his part. This week, though, Stallone has posted some new photos on his Instagram that suggest filming has already started on the new Rambo, with Collider reporting that Get The Gringo’s Adrian Grunberg is directing a story about the old Vietnam vet/super-soldier heading into Mexico to save a friend’s daughter from a drug cartel. That lines up with rumors we had heard in the past, so it’s all legit as far as we know. This next one specifically says it’s for Rambo 5, and while it looks less fake, it still looks like it should be in a commercial immediately after a shot of the U.S. Capitol Building surrounded by ominous, dark clouds. Maybe it should be paired with a pleasant, neutral voice talking about John Rambo’s merits as a Washington outsider? See, unlike career politicians, John Rambo isn’t in the pocket of lobbyists or special interest groups. He’s a veteran who was left with deep psychological damage because of the things he did in the name of the United States, and he now loves the United States a whole lot more than his opponent, Brian Dennehy, who has never slaughtered legions of foreign people with a machine gun. This November, Vote Rambo.